This essay by Simon Best and Stuart Masters was first published in The Friends Quarterly, Issue Three, 2014. 1. Rooted and Evolving – between our roots in Christianity and the Quaker heritage and the growing pluralism and questioning of this tradition and heritage within our communities? 2. Corporate and Individual – between being ‘a gathered people’ with a common identity, practice and message and the value of individuals who bring a diversity of gifts and insights to that community? 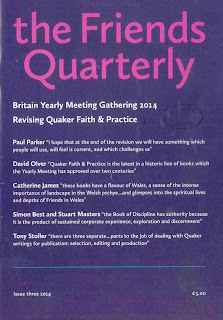 It would seem that for some time now the development of British Quakerism has been weighted quite strongly towards the evolving and individualistic impulse over that of a rooted and corporate focus. As this reflects dominant cultural patterns in the wider society, it will be interesting to see whether we are entering a period in which this trajectory is accelerated or rebalanced. We have divided our analysis into five main themes: the question of God & religious language, the purpose and experience of Quaker worship, the nature and shape of Quaker testimony, the practice of Quaker discernment and decision making and the issue of belonging and Quaker community. 1. Should we spend time arguing about what we mean by the word ‘God’ and the status of ‘God’ (e.g. as an objective reality or as merely a human concept) or should we give priority instead to the traditional Quaker practice of attending to the guidance of our inward teaching (however this might be understood) and seeking to demonstrate the nature of this teacher by the way in which our lives are transformed? 2. Do we wish to continue to define ourselves as being ‘rooted in Christianity but open to new light’? Some express doubts about this but given the significance of our Christian Quaker heritage and the influence of the life and teachings of Jesus for our practice and the general shape of our testimony, is it possible to ignore or deny these roots and maintain our integrity? 3. Should we remove what some believe to be archaic terminology from our Book of Discipline or would it be better to add to and expand the range of religious language used to reflect the richness and diversity of belief that exists within our communities? We know that early Friends used a large number of different words for the divine presence. Should we continue this tradition? 4. Given that the meaning of words change over time, does the revision process provide us with the opportunity to re-appropriate and reinterpret traditional religious language in a way that is compatible with our current insights? 5. As a community, should we set any limits to acceptable Quaker belief? Although we give priority to right living (orthopraxy) over right belief (orthodoxy), our beliefs can shape our conduct and the very idea that belief is unimportant is itself a belief. How should we handle this issue? 6. Do we recognise the danger of becoming too preoccupied with rationality and factual certainly? Friends have traditionally acknowledged the limitations of human knowledge and understanding and hence the need for humility. Are we able to maintain a respect for the value of doubt and mystery in our lives and in our spiritual journeys? 1. Is the traditional understanding of Quaker worship as essentially a shared communal experience beginning to wane? 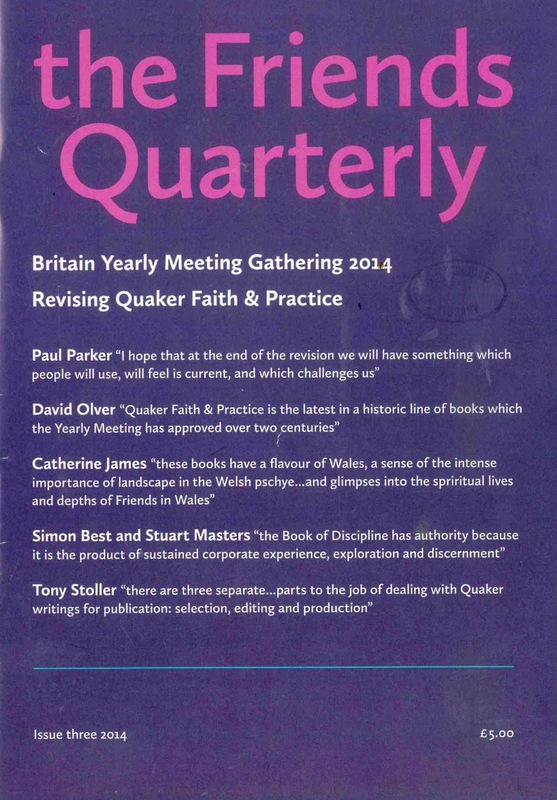 Do we need to reassert the corporate nature of Quaker worship practice or is this not a problem? 2. Is the idea that we aspire to being in a state of unceasing worship at all times and in all places still meaningful to us? If so, how do we encourage and nurture such a practice? 3. We know that in our communities there is a diversity of views about what it is that we are attending to in worship and a variety of different practices being adopted. Does this weaken the worship experience? Does this matter? 4. The issue of leadership and authority can be a controversial one. Do we fully recognise and value the role and authority of elders in nurturing the spiritual life of meetings and in ensuring the right ordering of worship? If so, are we prepared to recognise their authority in undertaking this role? 5. Is the centrality of worship as the essential context in which we make decisions and do our business as a community still something that we are prepared to take seriously as a spiritual discipline? How can we make this a more vital and fulfilling aspect of our corporate life? 6. Do we wish to emphasise the essential value of worship at all levels of the Society (at local, area and yearly meeting levels)? If so, how can we encourage greater participation of Friends at all these levels? 7. In order to deepen our experience and reconnect with earlier Quaker practice should we give a higher priority to encouraging communities to experiment with longer and untimed worship? How can this be achieved when Friends have increasingly busy lives? 8. Do we need to be more willing to experiment with a variety of worship forms to meet the diverse needs of people (e.g. families with young children) and the demands of a variety of circumstances? If we do, how can we ensure these are in harmony with traditional Quaker insights? 1. Do those drawn to our meetings by our social witness understand that what we do in the world is a consequence of our spiritual experience as individuals and as a community? How can we enable them to see our action in the world as having a spiritual dimension? 2. How can we avoid reducing the complexity of Quaker testimony to four or five words without being overwhelmed by a sense of helplessness? 3. How can we enable each other to see that ‘small steps’ and ‘big actions’ are both equal and equally valid expressions of testimony and will be right for different people depending on what resonates with their life and experience? 4. Are there any expressions of testimony that we would want to see as fundamental? 1. Do we still understand ‘God’ as a concept that is capable of having a will? If not what words can we use to describe our experience of making personal and corporate decisions? 2. 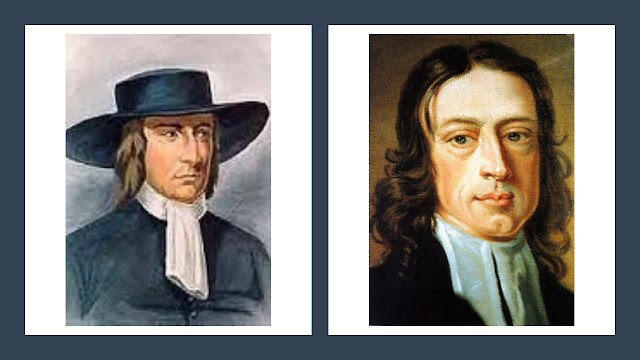 Is the Quaker business method still a practice of discerning leadings or have we moved to a place where consensus decision making and possibly even majority voting may be better? 3. Is the traditional understanding that discernment and decision making occurs in the spirit of worship still appropriate for us today? 4. Do all Friends understand the discipline of upholding decisions reached by Friends when we are not present, how can we enable this to be a reality? 5. Do we need to alter our decision making processes to ensure that all Friends feel a sense of ownership of the decision? Can we do this and not lose the essence of Quaker discernment? 1. What does it mean to belong to the Quaker community, and to a specific meeting or group? 2. Are we a support group for individuals each engaged on their own personal and private spiritual journey or are we a faith community with a corporate life? 3. How can we ensure that we meet the duties laid upon us by Yearly Meeting decisions, legal requirements and good practice without overwhelming meetings and Friends? 4. Given the reality of falling membership and deeply committed attenders should we bother having membership? Is it a purely administrative function and something we can do away with as we move into the twenty-first century when Quaker communities might become more fluid, meeting and worshipping in different groupings and in different ways? 5. In Listening Spiritually Patricia Loring writes that ‘the consequence of having no standard [for membership] is that the meeting conforms to the vision of those it has admitted’. Where do we draw the line in relation to membership? What are our standards for admitting people to membership? If the only apparent standard is that they want to join is that sufficient? 6. In what ways is saying you belong to a Quaker meeting, or you’re a member of the Religious Society of Friends similar to or different from saying “I belong to Greenpeace” or “I’m a member of the National Trust”? When it comes to revising the Book of Disciple we will be able to do the same? If we can then then this may be an enlivening and enriching process for us as a Yearly Meeting. If we can’t I wonder whether we will we find a volume that we can even agree on. It is also the case that any revision will result in Friends resigning their membership. Just as we have our personal faith journeys the Religious Society of Friends also has a corporate journey. There will be times when those coincide and others when the corporate journey means that individuals feel sufficiently out of step that they stand aside and go their separate ways. While this may be sad we should not be scared of this happening but accept it. In this article we have identified lots of questions that we feel need to be explored and addressed in the revision process. To a certain extent it doesn’t matter whether we do this as part of the revision process or as part of a preparatory process before getting to the substance of what, for example, chapter 12 might actually say. Of course our answers may very well be varied and partial and provisional – for that is what the Book of Discipline is – it is not a definitive text for all time and Friends in the future will want and need to revise whatever text we approve. However what we can’t do is avoid or fudge exploration of these various questions. The Book of Discipline sets our boundaries, it establishes where the balance currently is in the tension between rooted and evolving and between corporate and individual. What it is not is optional. We can’t say “I don’t like it, I’m not going to use it”. Of course we will find parts of it that express things closer to the way we would but the parts that challenge us also lead to growth. It can be an uncomfortable book but that’s one of its strengths because it is an expression of an uncomfortable faith. Dandelion, Pink (2008) Quakerism: A Very Short Introduction (Oxford University Press), p.39 & p.48. Membership within Britain Yearly Meeting has declined on average by 167 people per year over the past ten years www.quaker.org.uk/sites/default/files/Tabular-statement-2013-web.pdf page 11.